First you have to visit the official BLU for Cloud website at http://bluforcloud.com/. There you click on the button "Try BLU Acceleration now" and you are taken to an overview of currently four different usage plans. The plan I chose is the free trial plan which is hosted on SoftLayer, but there are also metered plans available on SoftLayer or Amazon WebServices (AWS), and a managed service on IBM BlueMix. 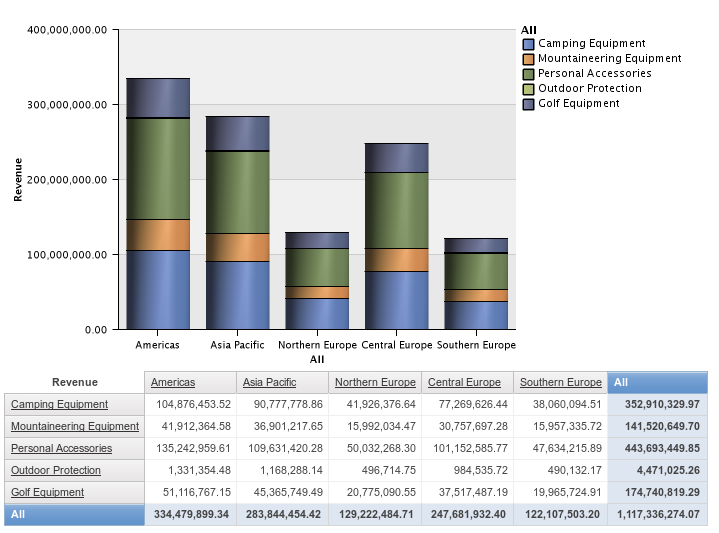 In the graphical report based on the sample database you can click on the regions, product categories, etc. and then continue to subcategories and subregions ("drill down"). Of course you could try out Cognos or Industry Models with your own data. 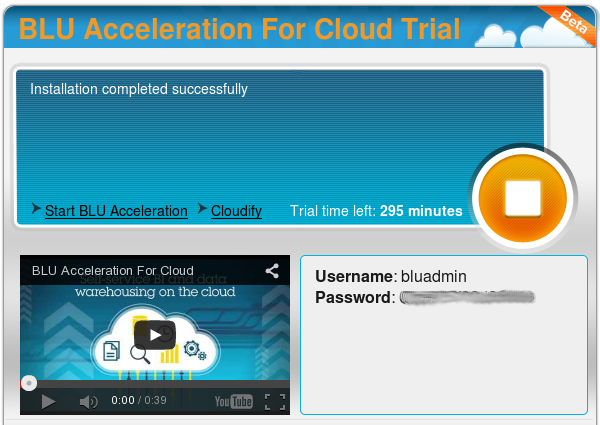 What I did next is to explore how well the Cloud offering integrates with my local tools. So I opened a local shell on my Linux-based ThinkPad and launched the DB2 command line processor. First I added the Cloud-based DB2 server to my local directory using the CATALOG TCPIP NODE command. Next was to add the remote database using CATALOG DATABASE. Last I connected to the database providing the username and, when prompted, the password. Yeah, connected! That was easy! From start to finish it took me about 5 minutes for the signup process, logging into the Cloud service and adding the remote DB2 server to my local system. Have you tried it? It is free and fun. And I can tell my boss that I know my way around in the Cloud. I have a small DB2 test database which I wanted to clean up. I ran a command which has the output below. Which command was it? BTW: The command can be found in the IBM Knowledge Center which will be/is replacing and integrating the DB2 Information Center. Over the last weekend, the annual Tuning World Bodensee was guest at the Messe Friedrichshafen (exhibition center and fair grounds). More than 100,000 people interested in car tuning traveled to Friedrichshafen. "Tuning" can be trying to get more performance out of engine or to customize the car to the personal style. With DB2, you can customize the command line processor to your personal style and preferences. Let's have a look at the available tuning options. Now you can edit previous statements using the EDIT command. "EDIT 1" would call the editor with the first statement in the command history, "E 1" would do the same. To know which statements are available, use the HISTORY command or its short version "H". The maximum number of available commands is determined by the variable DB2_HIST_SIZE. It accepts numbers from 1 to 500. To reduce the number of statements listed with the HISTORY commands, you can limit it: "H 10" would return the last 10 statements in history, "H R 5" would return the last five in reverse order. Instead of the option "R" you could also use the full word "REVERSE", e.g., "H REVERSE" or "HISTORY REVERSE". Editing commands is fun, but actually executing them is probably why they were edited. To execute a specific statement from the history, you can utilize RUNCMD. The short version is just "R" and a valid parameter would be the number corresponding to a "historic" statement. Both RUNCMD and EDIT, if not invoked with a number, will pick the newest statement in history. Both also accept negative numbers with "-1" being the most recent statement. export DB2_CLPPROMPT="DB: %d => "